were rescued at 7 weeks old. They were found under a deck in Bay Shore with no mother. 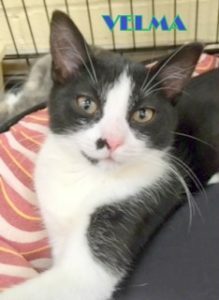 Adorable VELMA is 3 months old now, and ready for adoption at Last Hope Wantagh. This entry was posted in Adopted, Adopted Cats, Cats, Female, Under 6 Months, Wantagh Adoption Center. Bookmark the permalink.